" 'Change Happens Slowly Until it Happens Quickly': 'BradCast' 12/23/2015	"
On today's BradCast, we've got both good news and bad at year's end. First up, Kentucky's new 'Tea Party' Republican Governor Matt Bevin revokes the restoration of voting rights for 140,000 former felons as instituted by the former Democratic Governor. That, after the dubious and completely unverified results of the state's November gubernatorial contest. Yes, as we've noted for well over a decade now, elections matter! Bevin also did away with the previous governor's increase to the minimum wage for state workers, while he was at it. Also today, quick news on the Trump supporter (a middle-aged white guy) arrested with a bomb after threatening to kill Muslims at a mosque in California more than two weeks ago. Also, a quick word on the record number of sign-ups this year at Healthcare.gov for new and renewed health insurance policies thanks to the Affordable Care Act ("ObamaCare"). Then, I'm joined by Dr. Joe Romm, editor of Climate Progress and former Asst. Sec. of Energy in the Bill Clinton Administration, after his return from Paris where the UN struck its historic agreement just over one week ago to curb greenhouse gasses that cause global warming. As usual, Romm offers extremely informed and helpful insight, including his explanation for how the UN talks began earlier this month with the challenging goal of an agreement that would keep global temps from rising any higher than 2 degrees Centigrade, but surprisingly ended with an landmark pact that included the aspirational goal of 1.5C. "It became clear from just looking at the science that there's nothing safe about 2 degrees Centigrade," he explains. "What we've learned in the last 18 months, with the instability in the West Antarctic ice sheet, and all the extreme weather events that we're already seeing, and the brutal droughts we're seeing in this country and elsewhere, that we're already at dangerous impacts, and we're only at 1 degree Centigrade of warming. So, I think that reality did set in." He adds: "If you want to limit to 2 degrees Centigrade total warming, the planet's net emissions have to go to zero by the end of the century. So, pretty much every country is going to have to go to zero." Romm details exactly what that means and echoes remarks from my interview with Dr. Michael Mann last week, where Mann declared that the Paris Agreement signals the "end of the age of fossil fuels." "We are talking about the end of the fossil-fuel driven Industrial Revolution that began 250 or so years ago," Romm tells me. "And that's why, in some senses, this is such a big deal. Because you literally had every single significant country in the world, large and small, rich and poor, all sign on to this agreement, which recognizes, yeah, the age of fossil fuels is coming to an end." We cover a number of the steps ahead ("I was describing this as Star Wars Episode 4: A New Hope. We have a lot more battles before us.") during our wide-ranging conversation that also includes his complaints about Bill Gates' big new clean tech fund, and his response to the charge by NASA's former chief scientist Dr. James Hansen that the Paris Agreement is a "fraud". "I think we're certainly at an inflection point," says Romm. "You know, change happens slowly, until it happens quickly. I tend to think we have now entered the phase of much more rapid changed than people expected." 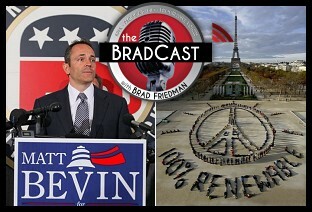 « PREVIOUS STORY "Insider Lottery Scandal Expands; Trump Embarrasses Americans; More Evidence TPP Threatens U.S. Law: 'BradCast' 12/22/2015"